These fungi can be harmful to your health and damaging to your home. If your home has mold or mildew, or has that damp musty smell, you’ll want to understand the affect it can have on the health of your family and the health of your home. Mold and mildew (as well as mushrooms) belong to the fungi family and require moisture and organic material to grow. Some molds are useful (like in cheese making or penicillin) while others can be extremely toxic. According to Mold Help, the most dangerous mold strains to humans are Chaetomiumzfbzcuyqsybrvyararsyawfcfawwursr (pronounced Kay-toe-MEE-yum) and Stachybotrys chartarum (pronounced Stack-ee-BOT-ris Char-TAR-um) “as they have been proven to produce demylenating mycotoxins among others, meaning they can lead to autoimmune disease.” As scary as mold an mildew can be in our homes, they serve an important function in our ecosystem. Fungi helps deteriorate the organic components within dead leaves or trash, which then turns that debris into soil. 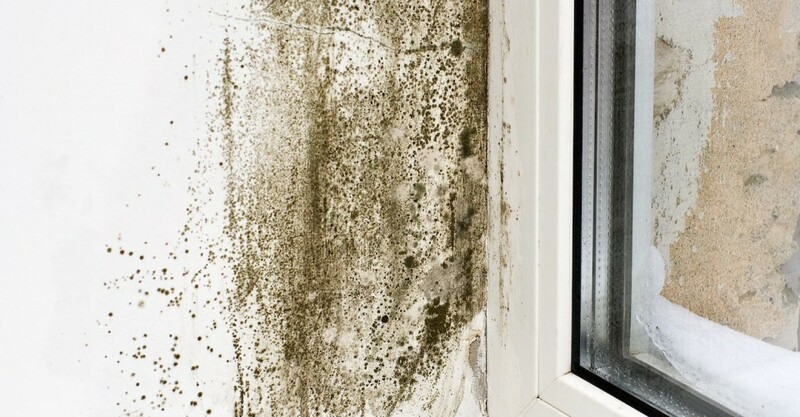 Some homeowners find mold or mildew growing after a flood or significant water damage. Other times, a homeowner may notice a faint mildew smell but not understand the source of the fungi. Knowing the most likely sources of fungi growth within the home, and how to get rid of it, is an important part of having a healthy home. Most people associate mold with mildew and believe that the two are the same. While both fungi have similar aspects and features, they also have some notable differences. This type of fungus is a decomposer of dead organic material that develops through spore, hair-like bodies in moist, warm conditions. Depending on the type of nutrients it forms on, mold appears in many different colors from gray, green, blue, brown, black, and white. It can look either fuzzy or slimy. Mold spreads rapidly and is therefor found in larger infestations. Mold can cause structural damage as well as health problems such as allergies, respiratory problems, mental status alterations, skin irritations, headaches, sore throats, coughing or fatigue. Although it is not common, some forms of mold in homes can be toxic. Unlike mildew, mold actually has some benefits to humans, such as food production or medicine. Our blue cheese or gorgonzola wouldn’t be the same without it and penicillin has saved countless lives. Mold requires moisture and organic material to grow, but various strains can require a differing amount of moisture. “Some are xerophillic (colonize under very dry conditions) some are xerotolerant (colonize under a wide range of moisture levels) and some are hydrophilic (colonize at high moisture levels),” according to Mold Help. This type of fungus is similar to mold in that it is also a decomposer of dead organic material and grows in wet and warm areas. Mildew can be more easily found as it surfaces quickly in smaller patches, rather than larger infestations like mold. It can appear more powdery and white, but it can also be yellow, gray, brown, or black. Exposure to mildew is less harmful than mold, but it still can impact your health with headaches, difficulty breathing, and coughing. Why is mold and mildew bad for the home? When mold and mildew develop inside of your home, it can be hazardous to your health and to the structure of your home. For people with breathing problems like allergies or asthma, mold and mildew can exacerbate preexisting conditions. But it can also cause problems for perfectly healthy individuals. Mold can start to grow on surfaces within 24 hours and reproduce quickly, as mold spores are small and light and can spread through the air and ducts. As mold digests organic material, it will eventually eat away at the material and cause deterioration. This deterioration can damage the structure of your home. Be aware of places in your home where mold or mildew can be found to avoid an infestation and better protect yourself, and your home. Your home’s HVAC system is a common transportation of mold and mildew throughout the home. Leaks in the roof, either caused from ice dams, poor insulation, or a damaged roof layers, can contribute to mold growth. Not only will leaks in the roof allow rain to be absorbed into the various layers, your home’s natural humidity rises up into the attic area, making this space an ideal spot for fungi. Mold can easily grow and spread within the insulation or plywood; it can also reside within objects in the attic. If you use your attic space for storage, you’ll want to make sure you regularly check this space for water leaks and mold growth. You can easily transport mold spores when moving objects in and out of attic storage. The best way to see if you have a potential mold issue is to have your roof and gutters inspected from the outside of your home, and have the attic space (especially the insulation and ventilation) inspected from the inside of the home. Flooding within a home is a very costly event. Every year homes experience flooding, from weather-related incidences, nearby construction or burst pipes. Even unknown drips within the walls or under a sink can cause damage and encourage mold growth. Basements are a common place for floods, as water can make it’s way in through windows, cracked foundations or interior plumbing. Some homeowners get used to a mold or mildew smell when entering the basement or can feel a distinct difference in humidity when entering the basement. If seasonal floods are an issue, consider installing a sub-pump to regularly pump out excess water. When it comes to flooding, a homeowner will want to take water damage seriously so that mold doesn’t spread throughout the home. Mold remediation specialist, flood clean-up crews or drywall contractors are well-versed in flood damage and repair. You’ll want to address the source of the flood as well as fix any damaged areas of the home. Poor ventilation in your home can encourage mold growth. As air circulates throughout the home, pockets of moist air can get trapped if ventilation isn’t adequate. Spaces like bathrooms and kitchens produce steam on a regular basis, causing the air and surrounding surfaces to become warmer and damper, providing the ideal location for fungi. Controlling your home ventilation, especially in rooms with higher humidity or condensation will help decrease mold and mildew growth. Make sure your bathrooms are fitted with exhaust fans and that your cooktops have the right size vents for your range. Rain and humidity can easily enter through small cracks in the window seals and around window casements. It’s important that if you suspect your windows to be extra drafty, you inspect the sealants and wood around the windows. Even though glass is not an organic material, small organic particles can live on glass and encourage mold growth. Don’t scrape this mold off as you can release the spores into the air. Use the below information for clean up. How do you identify mold or mildew in your home? A professional can test and inspect all areas of the home for mold and mildew. They most likely will send samples away to a lab for testing (some in-home kits aren’t accurate) and will also know how to safely remove and replace damaged areas. Protect yourself from any toxins or bacteria that mold holds by having the right materials for your clean-up job. Once you have thoroughly cleaned the surface and removed any mold or mildew, make sure to give the area ample time to dry. Check back a few times a day for any resurfacing of mold and make sure to monitor any nearby areas that could develop new mold or may not have been thoroughly cleaned. If mold still develops you may not have properly got rid of it and a professional may need to step in. Although mold growth can be surprising and sudden, there are a few ways to help prevent it from developing within your home. Make sure to fix any leaks or broken pipes you may notice in your bathroom or kitchen. Use appliances that are water-resistant and can easily be cleaned. Having a home inspection on your home can help lay out any faulty piping or systems within your home that should be checked or fixed. This can minimize the chances of a flood or pipe burst occurring. Consistent cleaning of your home can also help reduce the chance of mold growth by clearing out air ducts and ridding surfaces of dirt or soil. One other way to keep your home clean and dry is to purchase a dehumidifier to clear moisture in the air, decreasing humidity. This is especially important in locations with higher humidity as mold build-up can increase and be more common. Preventing mold growth in your home can be beneficial to both your home and your health. Foundations and basements can be painted with a special moisture block coating of paint, designed to block moisture and prevent mold and mildew from forming. There are also air quality specialist who can do a full assessment of the home and advise about which areas of the home are problematic.